He lost in a tight five-setter against Bautista-Agut and didn’t appear to be hampered but who knows how he felt the next day. He’s hoping to make his farewell at Wimbledon but isn’t sure if he’ll be able to play without too much pain in the months prior. So this may have been his finale . He’s a good example of how players batter their bodies; at the age of 31, he’s had back and hip surgery and problems with his ankles; he’ll probably be walking like an old man at 40 (see my article in Stuff.co.nz at https://bit.ly/2FUiwY7). Two Wimbledon titles, one US, Davis Cup winner, Olympic Gold and World no. 1, an amazing career. It’ll be interesting to see what he does next although he appears to be too depressed to think of doing anything at the moment. Djokovic and Nadal looked incredible throughout; it seemed that the only player who might beat them was one another. But we had two seriously good young newcomers in Frenchman, Lucas Pouille and Greek, Stefanos Tsitsipas. Djokovic beat another promising young player, the 22 yr old Russian, Daniil Medvedev. Medvedev has the strangest of styles with grips so weird that he can’t really volley properly, a huge disadvantage in the men’s game. He also didn’t look particularly fit. Tsitsipas put out Roger Federer in a thrilling four-setter. Federer had 12 break points and couldn’t convert a single one. This is the third Slam in a row that Roger hasn’t been past the quarter-finals. He must be sick of being asked when he’s going to retire but it can’t be far off. Tsitsipas had huge support from the vast numbers of Greeks who live in Melbourne. When asked what his goals were he said he hoped to be “humble, happy and polite”. How can you not love him? Another young hope, Frances Tiafoe, had a great scalp against Grigor Dmitrov. It was the youngster’s 21st birthday, one he won’t forget. Dmitrov threw all his rackets into the crowd at the end. Was he implying that he had finished for good? Tiafoe’s signature dish is to tear his shirt off after he’s won and parade round the court, flexing his muscles. Wouldn’t it cause tongues to wag if a female player were to do the same? She would probably be fined. Apart from Lucas Pouille, the French players didn’t make great inroads in the tournament but Pouille must fill his home fans with hope. Unusually, he is coached by a woman, Amélie Mauresmo, former coach to Andy Murray. She was lambasted and Murray was ridiculed for being the first of the top tenners to be coached by a woman. It was interesting to note that there wasn’t a whisper of criticism this time round. John McEnroe remarked in an on-court interview “I’m getting the feeling that a lot of these guy players are going to be hiring female coaches now”, to which Pouille replied, “They should. She has the right mindset, she knows everything about tennis. It’s not about being a woman or a man, you just have to know what you’re doing and she does”, to which the crowd erupted into applause. Pouille made it to the semis, but was slaughtered by a near-perfect Djokovic in three very easy sets. In the other semis, Nadal butchered Tsitsipas in similar fashion. So we got the final most people wanted. Numbers 1 & 2 seeds, both at the top of their game. In the end, it was a bit of a damp squib. 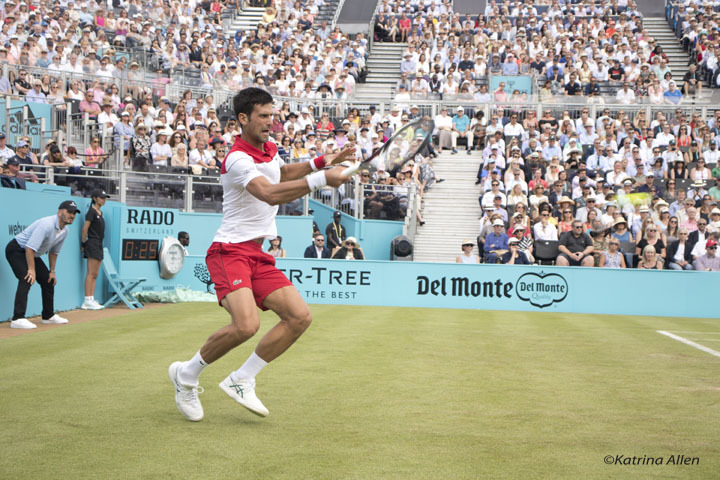 Nadal was unusually nervous and Djokovic couldn’t put a foot wrong, absorbing the Spaniard’s pace of shot and consistently anticipating both his serves and groundstrokes. 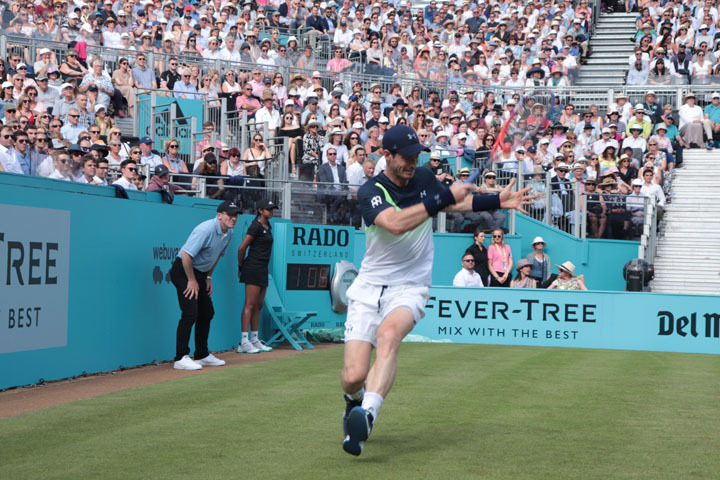 He strolled through the match, toying with his opponent and ran out the winner 6–3, 6–2, 6–3. Perhaps Nadal will get his revenge during the clay court season but that now looks far from certain. There was huge home support for the young Ashleigh Barty who had a brilliant win over Maria Sharapova, but was finally outclassed by Petra Kvitova in the quarters. Barty has a refreshingly varied game including great volleys and a viciously-sliced backhand. I wish there were more women like her. Serena Williams was back again with her usual flourish, instilling terror into most of her opponents, until something really strange happened in her quarter final against Karolína Plíšková. She was 5-1 and match-point up in the final set and basically blew it. She had more match-points, couldn’t convert, and lost six games in a row. It must have really shaken her up. She is still trying to reach 24 Grand Slam singles titles to equal those of Margaret Court, but in spite of being the heavy favourite, has now failed to do so in the last three. Serena’s fashion choices have often been somewhat dubious; that black catsuit in Paris, the bizarre tutu and fishnet tights in the US Open and this time round, a pea-green romper suit. I simply don’t understand what goes through her head though I suppose they do make a statement. Oh, and she also came onto court and knocked up in some sort of baggy black mac before the big reveal. I’m dying to know what she comes up with next. And who on earth is Danielle Collins? The American, who lost in the last round of qualifying last year, hadn’t won a single match in a Slam until this event and came out of nowhere to go all the way to the semis. Commentators called Collins ‘feisty’, a polite way of referencing her gamesmanship; she changes her racket in the middle of games for no apparent reason other than to unsettle her opponents, constantly questions the umpire and is generally pretty adept at niggling her rivals. But she got her comeuppance against Petra Kvitova. Two years ago, Kvitova was knifed by an intruder who severed tendons and nerves in her left playing hand, for which she had major surgery. It’s noticeable how she holds her racket in her right hand right up to the moment she starts the rally. It clearly still affects her and not just physically; every time she is asked about it, tears well up. It’s pretty remarkable that she’s playing at the top again, let alone getting to the final of a Slam. Kvitova played 21 yr old Naomi Osaka in the final. Remember Osaka? 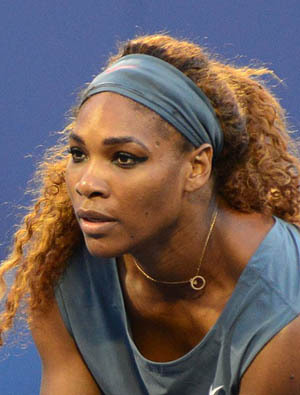 She was the player who beat an appallingly badly-behaved Serena Williams in the US Open final and ended up crying instead of celebrating her victory. How good it was to see her win this title without all that negative emotion. It was a close three-setter which Osaka nearly fluffed through nerves, but she came through 7-6, 5-7 6-4 to the delight of most of the crowd. She’s big business in her home country of Japan since the US Open win; in fact she looks a bit like a walking billboard, shirt plastered with various sponsor logos and wearing, get this, a “titanium-encased Citizen Eco-Drive Bluetooth” watch. I spotted something rather curious on the women’s trophy as she was holding it aloft. Previous winners names included Mrs M Court (WA) and Mrs E Cawley (NSW). It’s a bit like putting Mr A Murray (Glasgow) on the Wimbledon trophy and an indication of just how localised the Aussie Open was in the old days. Few top players outside the country played in the event. Only two non-Aussie men won the event between 1959 and 1976, and three non-Aussie women between 1959 and 1978. It was partly due to the fact that getting there was so lengthy and uncomfortable in those days, which meant that players had to get there several days early to get over the jet-lag. Maybe flight costs were also a factor, before the days of massive prize money and competitive airlines. It wasn’t a Slam treated with as much respect as it is today. Now it stands firmly on the map as one of the great tournaments. It was certainly a good one this year.